If you ever thought of taking up extreme downhill biking as a sport, watch this video first and then think again about your decision. The heart-racing video was taken last year by Sam Reynolds, a professional bike free rider and madman from England. It was taken at the Red Bull Rampage 2015 MTB Freeride Event competition held at the Zion National Park in Virgin, Utah, United States. It’s pretty amazing that Reynolds was able to navigate himself safely despite the narrow track. He even pulled of some amazing tricks in the air, such as a beautiful no-hander and a death-defying superman over the canyon gap, a trick which gave him the Best Trick award at the competition. However despite the amazing (and dangerous) run, Reynolds only scored 83 points, good enough for 9th place among 20 competitors. The riders were judged according to their choice of lines down the course, their technical ability, and the complexity of tricks. Kurt Sorge from Canada won the top prize after getting a score of 96.50. 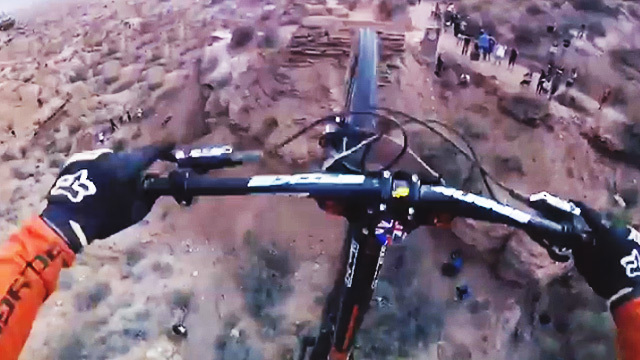 Don’t worry we won’t place his video here, because one extreme biking video is enough.